The last year was an important one for The World of Irises. In late October, our number of views passed one million, a significant milestone. During the year, we have had posts of all types of irises. 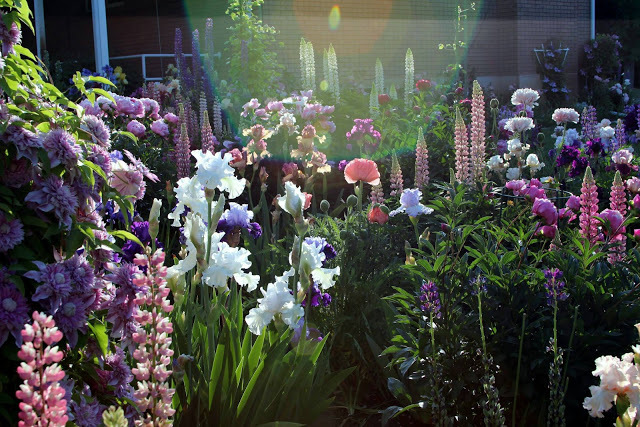 It is useful to look back and note the most viewed The World of Irises posts. Here are the top ten for 2018. If you missed any of these blog posts, just click on the title and it will load the article for you. The most viewed post of the years was "Talking Irises" - THE 2018 TALL BEARDED IRIS BLOOM SEASON: A SPECTACULAR SHOW! By Susanne Holland Spicker. This was a guest post and we miss Susanne’s colorful articles as she had been on a sabbatical from writing. That post was followed by “Photo Essay: A Visit to Schreiner's Iris Gardens” By Mike Unser. Next was Tom Waters’s important post about the complicated issues of fertilizing: “Fertilizing Irises.” This post lead to many serious discussions and some of us have changed our gardening habits based on its information. Tom Walter’s post about fertilizing was followed in views by Keith Keppel’s “New Color Combinations in Plicatas, part 2." Bryce Williamson’s post about the new and yet unnamed iris species was next: "New Iris Species Azure Blue." Next in line was Ginny Spoon's post about East Coast reblooming irises: "Reblooming Iris: A Love Affair."